If you don’t like Windows 8 out of the box, you can customize it, with some exceptions. Perhaps the most controversial exception (as mentioned earlier) is the fact that you can’t set windows to boot directly to the desktop, though third-party utilities may enable this. One configuration option that Microsoft has buried in the past is the startup configuration. In older versions of Windows, customizing which applications launched on startup required entering the Msconfig system-configuration utility. Now, in Windows 8, you can select which applications launch at boot-up with the new Startup tab in Task Manager, which you can easily launch in Windows 8’s simplified Start menu. Some customization configurations are less obvious. One example concerns the games you might buy from Valve Soft-ware’s Steam download service. When you install a game from Steam, the procedure asks you whether to create a desktop shortcut. But that shortcut isn’t an application shortcut; it’s actually a URL, which points to the local Steamapps folder where the game is installed. If you right-click a URL shortcut, you’ll find no option to pin it to the Start screen. Instead, you have to copy the shortcut to the Start Menu folder (yes, it’s still called the ‘Start Menu’ folder), typically in C:\Users\user folder\AppData\Roaming\Microsoft\Windows\Start Menu. Desktop customization is also available, except for the obvious lack of Start-menu tweaks. The taskbar is present, as it was in Windows 7, and you can pin applications to the taskbar as before. On top of that, Microsoft added a new programming interface, Direct-Text, which offloads text rendering to the GPU. Text-rendering performance in desktop programs and in Windows 8 apps is double that of Windows 7 – often better than double. The ‘Reset’ option nukes the hard drive and reinstalls Windows from scratch. You can use this option to get the machine back to a factory-fresh Windows install, without the need for a new Windows key or the Windows setup disk. If you prefer something less drastic, the ‘Refresh’ option resets important Windows setting but maintains your personal files and installed Windows 8 apps. Note, though, that it doesn’t keep desktop applications, so you might wish to first uninstall or deregister software that will need reinstallation and activation. Finally, you can customize the refresh process by using the “recimg” command-line tool. Using recimg makes an image of your current version of Windows – including installed desktop applications – and makes that the default image when you refresh your PC. Then, when you run Refresh, you’ll still reinstall Windows from scratch, but you’ll also retain your desktop applications. 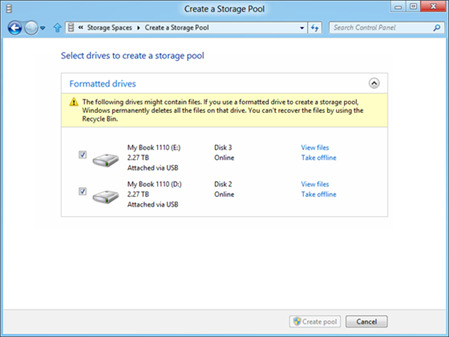 You will need to run recimg occasionally, if you have desktop programs that you don’t want to reinstall all over again. The base PC hardware requirements for Windows 8 are the same as they were for Windows 7 – perhaps even a little less stringent. That means Windows 8 should run more effectively one, for example, machines using the latest Intel Atom processors, as we might see on some Windows 8 tablets. Beyond the basics, Windows 8 supports new hardware, the most obvious being touch-enabled hardware. Of course, Windows 7 supported touch, but it never let you forget that touch was a bolted-on feature. In contrast, the touch interface is as much a part of Windows 8 as a keyboard and mouse are. 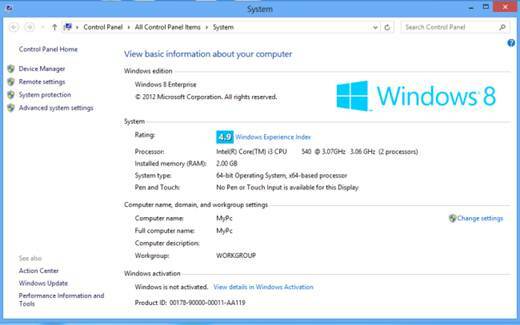 Windows 8 supports full ten-point multitouch, including support for multifinger and even two-handed gestures. This fall, we’ll see standard clamshell laptops with ten-point touchscreens. Having briefly used one, I can say that touch enables casual browsing and media consumption more easily than a mouse and keyboard do. New laptops without touch-enabled LCDs will have ten-point multitouch touchpads that support edge detection. Working with such a touchpad is merely an extension of using a Windows 7 touchpad, so you can use one of these new touchpads just as you did an older one, if you prefer, or you can take advantage of the new capabilities. What seems to be missing at this point is a range of desktop displays supporting ten-point multitouch. PC companies are readying a number of all-in-one systems with touch, but traditional desktop systems with touch displays, as well as standalone touch-enabled displays, seem to be nowhere in sight. In addition to clamshell laptops with touch, we’ll see more convertible laptops with touch displays that either fold over the back of the system or detach from the keyboard to become a tablet.